Every day, more than 125 Lifewater staff members across eight international field offices work to bring safe, sustainable water and improved health to every child and family who needs it. It’s no easy task, yet they persevere through difficult weather, exhaustion, and all types of technical challenges. They trudge through the Cambodian mud, the Ugandan heat, and the Ethiopian mountains to reach the farthest, underserved communities in the world. They represent the love of Christ, and today, hundreds of thousands of people have safe water because of them. At Lifewater, our values are our compass; they help us remember the who, why, and how of our work. Meet seven Lifewater staff who exemplify these traits and who love well in every circumstance. Cathy (right), visits Healthy Homes while on crutches as she recovered from leg surgery. Pins held Cathy’s leg together during her first few weeks at Lifewater. She’d just been in a car accident, yet she showed up to work, carrying herself around rural Ugandan villages on crutches and smiling through it all. That was the first time we learned of Cathy’s dedication and perseverance. 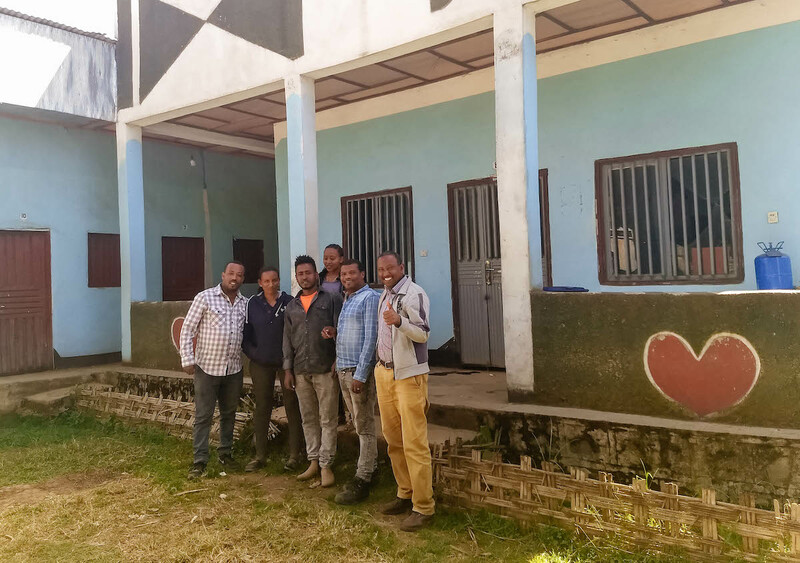 Then in 2018, Lifewater’s Mayuge Program Manager, Bosco, suddenly passed away. While our team was grieving, Cathy stepped up in a familiar way, filling the sorely-needed vacancy that Bosco’s tragic passing had left, and guiding our Mayuge team even while she was mourning. She represented the Cathy-like perseverance that our team had grown to know and love, and she exceeded every standard set for her. Today, Cathy provides oversight and support to our team in the office and monitors village progress towards Healthy Village status three days a week. Emma clips nails for children at a school in Mayuge, Uganda. Emma is one of the kindest and most gentle people that we’ve ever met. Julie Waechter, Lifewater’s Deputy Director of Programs, recalled this about Emma while visiting schools with him in Uganda. At schools, clipping nails is advised for health, because germs can be difficult for children to wash away from under their nails. But, many homes and schools don’t have nail clippers. “He did it so quietly and subtly and didn’t draw any attention to his kind acts,” Waechter said. Each day, Emma wakes at 5 a.m. to do his morning prayer and prepare his tea before hopping on a Lifewater motorcycle and heading into the villages, where he’ll spend the next eight hours. 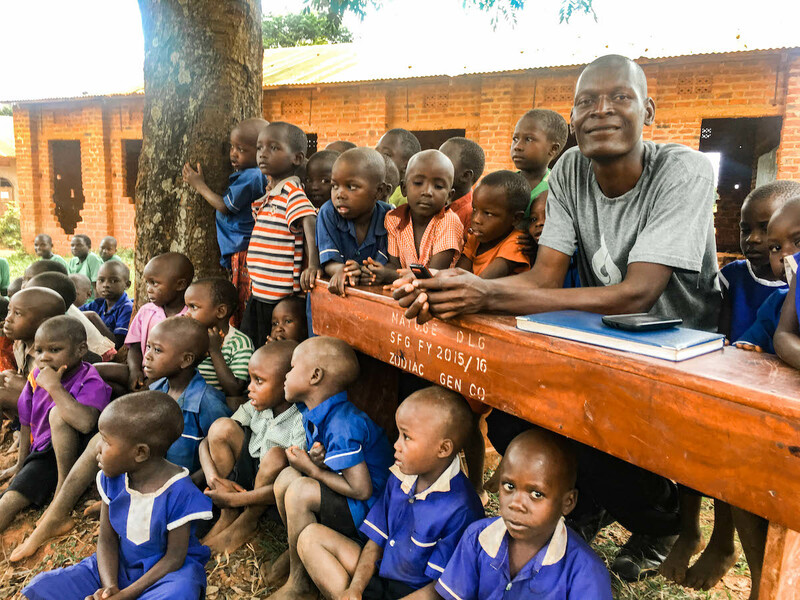 Emma loves leading morning devotions at Lifewater’s Mayuge office, but the best part of his day is always spent with village residents, helping villages learn life-saving health practices, establish water committees, and receive safe water. “The people in the village have inspired me by always showing love,” he said. 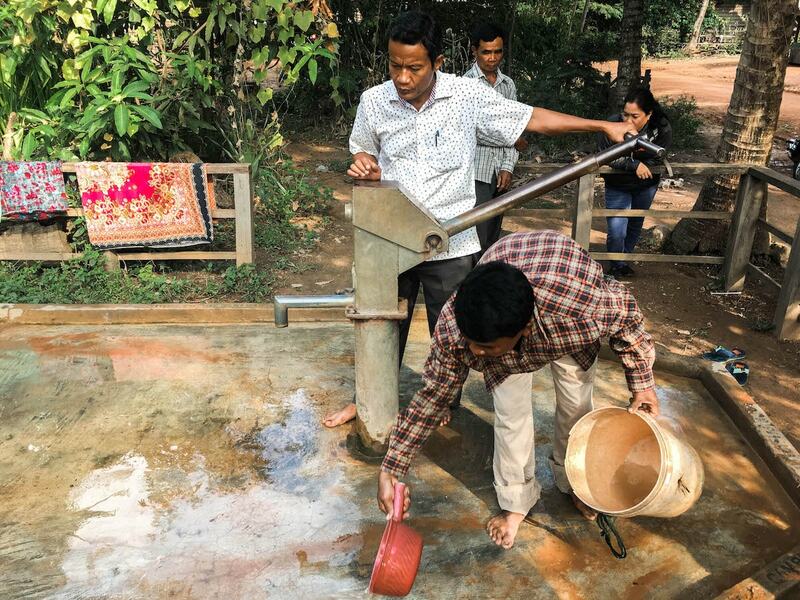 Sam Onn tests out a well in a rural village. Each morning before work, Sam Onn Skypes his wife and children in Phnom Penh, Cambodia’s capital city; at the end of the day, he’ll call them again to say goodnight. 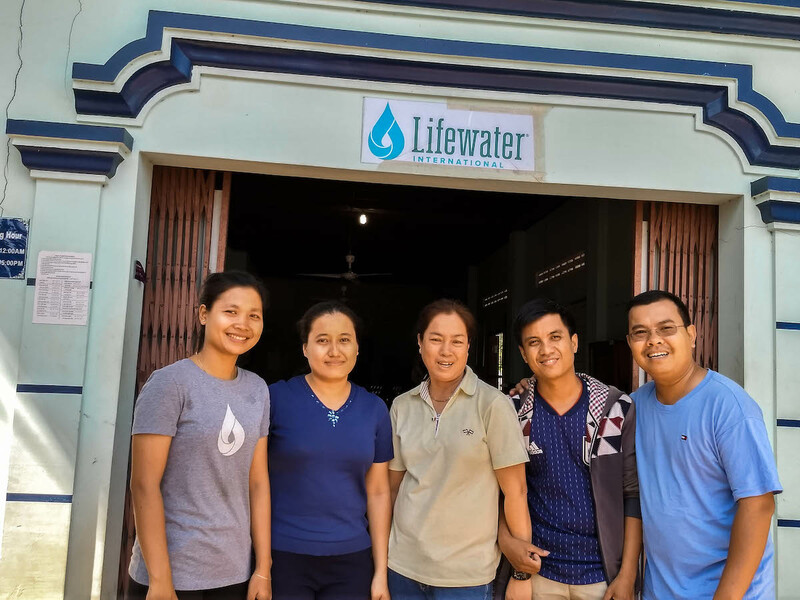 The father of three moved to Lifewater’s program area, Svay Leu, to be closer to the communities he is serving. A keen listener, the Program Manager is known for his close relationship with village residents. On an average day, Sam Onn arrives to work at 7:30 a.m. to lead the team’s daily devotional, review expense reports, and manage the Svay Leu office. He’ll head into the villages once to three times a week. “The best part about working with communities is the loving relationship between us and them, seeing the change in behaviors among families, and watching communities learn about health and hygiene and come to value those things,” he said. Boremey Sann is a nurturer. He is kind and caring to all team members without bias, and he manages to be the jokester of the Cambodia team while emanating a recognizable wisdom. He rises early, stays late, and has been known to work even on his days off. Here at headquarters, we call Boremey the “Swiss army knife” of team members; Boremey manages HR administrative work, he is our translator, and also acts as a journalist, gathering stories from the field to report to donors. Boremey loves working directly with families. “I’m inspired to serve the poorest of the poor, to take part in a team who advocates for the better of poor communities, to do what it takes to bring justice to the needy, to have the heart for the least and provide support to the outcast,” he said. Musa (left) with some of Lifewater Ethiopia team members. At Lifewater, community participation is vital to creating sustainable change. But, convincing all of your neighbors to do any one thing is a challenge, and communities who are unfamiliar with safe water and sanitation practices must be convinced of their benefits. Musa is always considering ways to improve our work with community members and leaders, and he’s famous for thinking up games and dramas that reinforce healthy behaviors. Meron (red scarf) helps a young girl lift her water container. 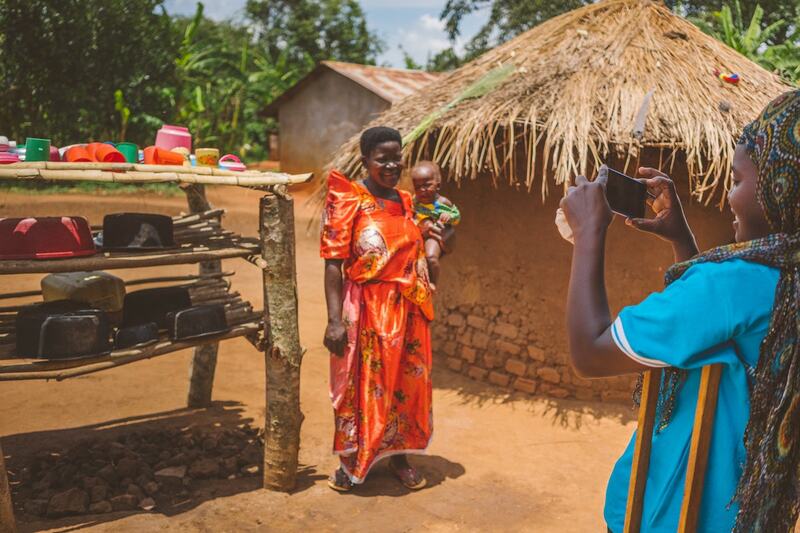 With her bright blouses and quick smile, Meron is a ray of light in Nensebo. Yet, it’s Meron’s unwavering devotion to Lifewater’s village health promoters that will most likely catch your eye. Health promoters are local village residents who commit to teaching their neighbors simple, yet life-saving health practices. Meron supports and oversees the health promoters in the Nensebo region on Ethiopia. Christine Atherstone, Lifewater’s WASH Program Officer for Ethiopia, recalled a meeting with Meron and local government health workers. The meeting was running late, and it was about 6:30 p.m. Meron received a call from one of her health promoters, and despite the long day and the important status of the people they were meeting with, Meron stepped out to take the call. In that moment and many moments before and afterwards, she showed that everyone plays a valuable role on her team. Under our “servant leader” value, it reads, “We shall be known by our love, not our position or status,” and Meron is the embodiment of that promise. 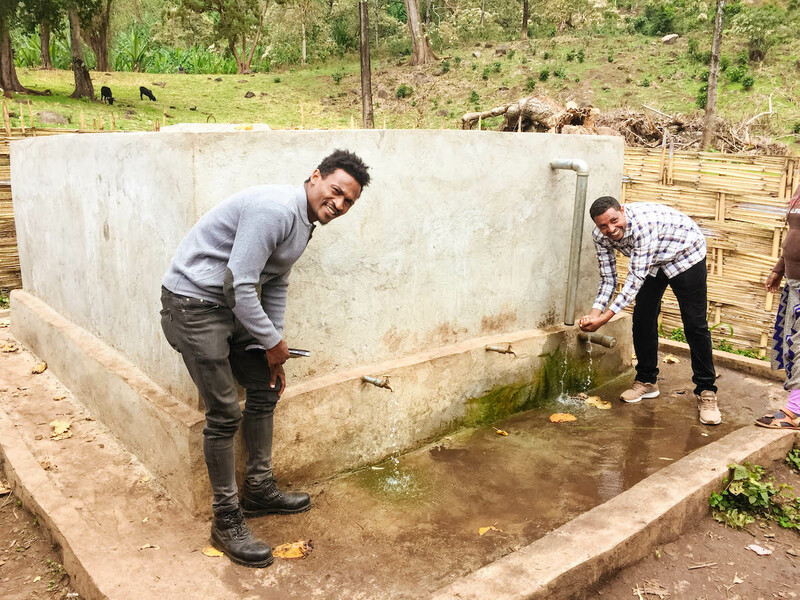 Alex (right) testing out the new protected spring in a rural village. Alemayehu, also known as “Alex,” truly has a gift with people. His kindness is comforting and he has a smile always ready to shine. “The best part of my job is when our work excites communities and brings change to the lives of children and mothers,” he said. One time, while teaching communities how using the restroom in open fields and near water sources was making them sick, he encountered an elderly man who was insistent on disturbing the event. 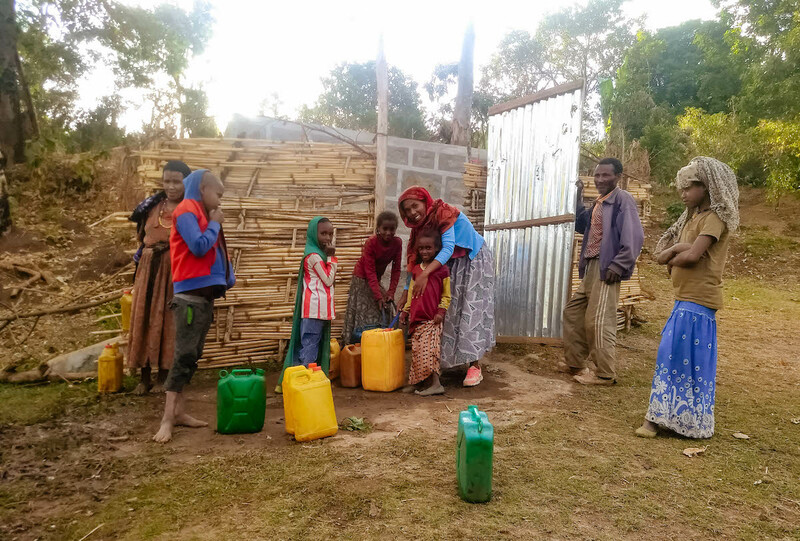 Our WASH Program Officer for Ethiopia, Christine, was there to witness it. “By the end of it, the man was laughing and chiming in with what the community was going to commit to do, and he gave Alex a huge hug as we were saying goodbye,” she said. Alex was warm when he could have been indifferent and even spiteful. And like so many of the stories we hear about our staff, his ended in a friendship. Thank you, Lifewater staff, for your hearts for the least and last, for your early mornings, late nights, and for your unrelenting love.